Nepal Tiger Trust mission is to protect wild tigers forever in Nepal by long term tiger monitoring, mitigating human-tiger conflict, supporting anti-poaching efforts in collaboration with park management and local communities. The tiger has an inherent value representing the cultural, religious and spiritual practices in Nepal and other south Asian countries. Apart from inherent value, tiger as a large predator characterized as keystone, umbrella, flagship, or indicator species maintain healthy ecosystems that provides ecosystem services to human being and all living forms. Saving tigers will also help protect all other related species and habitats. Additionally, tigers are admired for their beauty, power and intrinsic value and at the same time is feared by people. Such characteristics of tiger attracts tourism where tiger exists, eco-tourism can then contribute local communities as an alternative livelihood. Finally, saving tigers is our ethical responsibilities. Tiger face many threats. Poaching of tiger and its prey base is one of the biggest threat to tiger persistence. Tigers are hunted for fur, bones, teeth, nails and are illegally sold in the international market for superstitious rituals and medicinal values. Habitat loss, degradation and fragmentation is another pivotal factor for depleting the tiger populations. 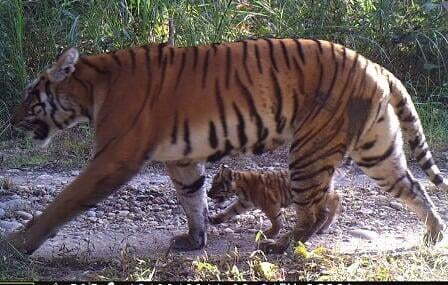 The fragmented habitat supports small and isolated tiger populations which can lead tiger susceptible to inbreeding. Finally, the human-tiger conflict has become another critical threat for tiger conservation presenting unique dilemmas to wildlife managers. Our approaches has been to understand these threats to finding solutions. The Long-Term Tiger Monitoring project addresses the basic habitat requirements needed for long-term persistence of tigers. The project goal is to understand the tiger movement patterns, dispersal, population structure, communication, reproduction, and longevity of tigers in the western part of Chitwan National Park. Likewise, Participatory Anti-poaching projects in Bardia and Chitwan National Parks focuses on collaborative and proactive patrolling & information sharing network, supporting National Park authorities in their anti-poaching efforts. Last but not least, our tiger trackers as part of the Rapid Response Team assists in resolving human-tiger conflict situation when occur. Become a member and enroll in acts that contribute to saving the tigers with us. Volunteer in our programmes to protect and preserve the tigers. Or contribute what you can by donating to Nepal Tiger Trust and be a part of the effort.